In the 11th and final level of Day 3 of Event #61: $10,000 Pot-Limit Omaha, just 14 minutes away from having to return on Tuesday to complete the event due to the Main Event, Daniel Alaei defeated Jared Bleznick heads up to earn his fourth career World Series of Poker bracelet and second PLO championship. Along with the gold, Alaei earns $852,692 and 103 points for his own team in the $25,000 Fantasy league, vaulting him into second place. Day 3 began with 32 players representing 12 different countries, but once the official final table was set, the only non-Americans were Russian Alex Kravchenko and Irishman Rory Rees Brennan. They exited in ninth and eighth place respectively, leaving only Yanks to fend for the title. The next player to exit was Sean Dempsey, who never seemed to get anything going today, and Gjergj Sinishtaj followed him out the door in sixth place. Sinishtaj is only 21 years of age — this was only his third career live cash — and according to Jared Bleznick, he has a very bright future. He’d even bet on Sinishtaj winning the Main Event in the next five years. Numit Agrawal was eliminated in fifth place, nearly a half an hour later Tom Marchese busted in fourth, and despite doubling during three-handed play, James Wiese fell in third. With over 110 big blinds in play, and only a 1.5 million-chip difference between Alaei and Bleznick, it looked like heads-up play could last quite some time, and the two would have to return on Tuesday to finish the match. Alas, all Alaei needed was one hand to defeat Bleznick, and he is now the 61st and penultimate champion of the 44th annual WSOP. Thank you for joining us for our coverage of this event, and we look forward to having you back for the rest of the Main Event. Until then, goodnight from Las Vegas! Hand #184: An exciting final table has just come to an abrupt conclusion after just a single heads-up hand. The players had repositioned themselves on opposite sides of the table, with a cursory counting of chips determining that Alaei had the edge going into the hand. Daniel Alaei then raised to 200,000 from the button and Jared Bleznick called. The flop came and Bleznick checked. Alaei bet 275,000, and Bleznick responded by raising the pot — 1.25 million. Alaei called without too much hesitation. The turn was the , and Bleznick instantly announced he was betting the pot. Alaei raised all in, and Bleznick called. Just like that all of the chips were in the middle, with Bleznick the one at risk. The pair stood as they each tabled their cards. Bleznick had for an open-ended straight draw while Alaei had turned a set of tens with . Bleznick was already leaning over and shaking Alaei's hand before the river came the , pairing the board and improving Alaei's hand to a full house. Bleznick shook Alaei's hand once more, still smiling despite coming one spot shy of the victory. 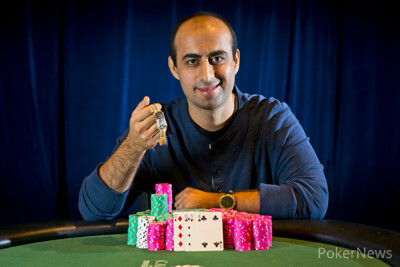 Bleznick earns a handsome $526,625 prize for his efforts in Event #61, while Alaei has won his fourth WSOP bracelet! Hand #177: James Wiese raised to 200,000 on the button, and received no callers. Hand #178: Jared Bleznick limped in from the small blind, Wiese checked in the big blind, and Bleznick took down the pot with a bet on the flop. Hand #180: Wiese raised to 200,000 on the button, Daniel Alaei called in the small blind, and the flop fell . Alaei led out for 250,000, winning the pot. Hand #181: Alaei raised to 250,000 on the button, and won the pot. Hand #182: Alaei received a walk. Hand #183: Wiese raised to 200,000 on the button, Bleznick three-bet the pot (650,000) in the big blind, and Wiese called. The dealer spread , and all of the money went in the middle. The turn and river came , respectively, and Wiese was eliminated in third place. Hand #173: After Daniel Alaei limped in from the small blind, Jared Bleznick raised from the big blind and Alaei called. The flop came . Alaei bet 300,000. Bleznick quickly announced he was all in, and Alaei just as quickly folded. Hand #174: James Wiese raised from 250,000 from the button and won the blinds. Hand #175: Alaei raised to 250,000 from the button and Bleznick called from the small blind. The flop came . Bleznick checked, and when Alaei bet 275,000, Bleznick folded. Hand #176: A three-way limped pot saw a flop come . It checked to Bleznick on the button who bet 100,000, then Wiese check-raised to 250,000. Alaei folded and Bleznick called. The turn was the and Wiese checked. Bleznick bet 100,000 again, and this time Wiese just called. The river was the and both checked. Wiese tabled , and Bleznick mucked. Hand #166: Daniel Alaei raised to 200,000, James Wiese defended his big blind, and the flop came . Wiese checked, Alaei fired 275,000, and Wiese folded. Hand #167: Alaei received a walk. Hand #168: Alaei completed from the small blind Jared Bleznick checked, and both players knuckled on a flop of . The turn was the , Alaei led out for 325,000, and Bleznick folded. Hand #169: Bleznick called from the small blind, Wiese checked, and the two checked it down as the board came . Bleznick won with a pair of kings. Hand #170: Bleznick raised to 200,000 on the button, Wiese called in the small blind, Alaei called in the big blind, and the dealer fanned . Wiese checked, Alaei slid out 400,000, Bleznick folded, and Wiese called. 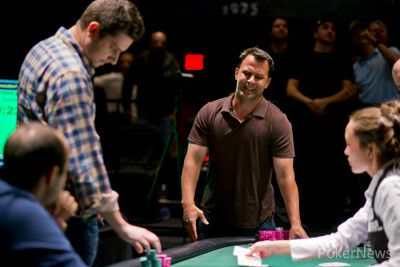 The turn brought the , and Wiese check-folded to a bet of 750,000. Hand #171: Bleznick received a walk. Hand #172: Alaei raised to 250,000 on the button, Wiese called in the big blind, and the two checked on a flop of . The turn was the , Wiese led out for 350,000, and Alaei folded. 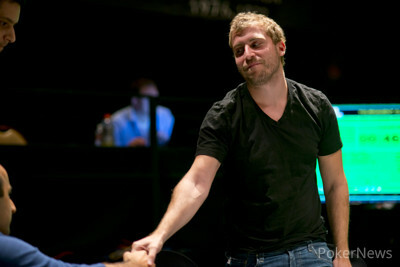 Hand #164: Jared Bleznick raised to 300,000 from UTG/the cutoff seat and won the blinds. Hand #165: Preflop action between Bleznick and Tom Marchese saw the latter having committed a lot of his chips by the time the arrived. That's when Bleznick set out a bet of 500,000 and Marchese called all in. Bleznick had the lead, and after the turn and river his had was still best, eliminating Marchese in fourth. 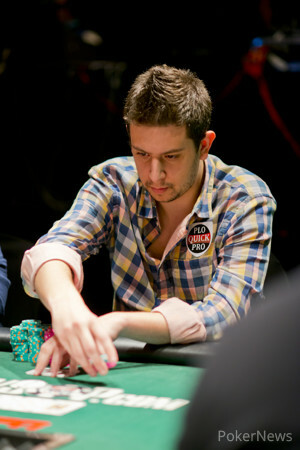 Hand #156: Tom Marchese raised on the button, winning the blinds. Hand #157: Daniel Alaei raised to 300,000 in the small blind, and Jared Bleznick folded his big blind. Hand #158: Bleznick raised the pot in the small blind, and Marchese folded in the big. Hand #159: Alaei was the first to act, and raised to 200,000. James Wiese called, and the flop fell . Both players checked. The turn was the , Wiese led out for 400,000, and Alaei folded. Hand #160: Alaei received a walk. Hand #161: Alaei raised to 300,000 out of the small blind, and Bleznick folded. Hand #162: Marchese received a walk. Hand #163: Alaei was first to act, and he raised to 200,000. Wiese called in the big blind, the flop came , Wiese checked, and Alaei fired out 300,000. Wiese called. The turn was the , Wiese led out, Alaei moved all in for effectively 1.195 million, and Wiese called. Wiese had turned a set of eights, but needed to fade a spade on the river. The river was black, but the was a brick, and Wiese doubled. 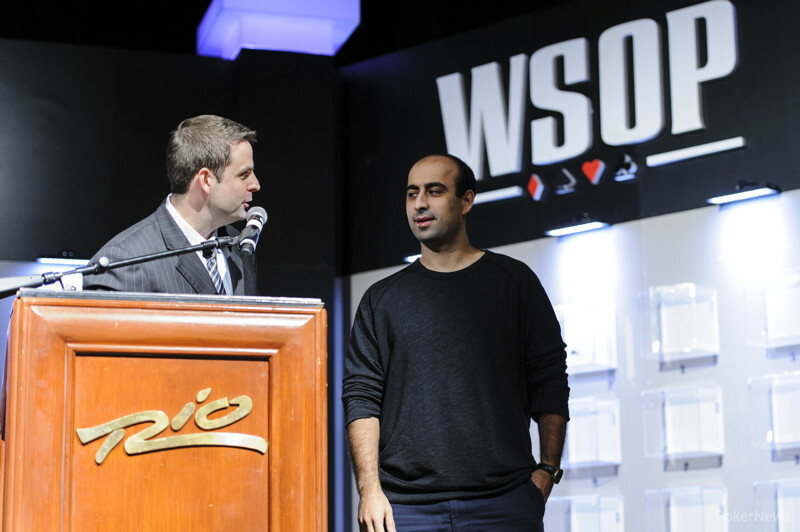 2013 WSOP Event 61 Gold Bracelet Winner Daniel Alaei & wife, Ara.